Brand new USB cable, tested, known to work with Printer & Scanner. All USB ports work fine with every device Iâ€™ve tested. I purchased my Pod XT Live used, several months ago. Iâ€™ve tested it with guitar amps and headphones, and it seems to function properly. Itâ€™s in perfect condition, save for a few small paint scuffs on the corners and edges of the housing. The retirement age gent I bought it from said heâ€™s never had it out of the house, and I believe him. Thereâ€™s not even any visible wear on the footswitches or the CC pedal. Unit seems virtually new. Make sure you are connected to the internet. Reason: (Code 800038C6) Unknown server error occurred. programs running, try temporarily disabling them. â€¢ I am ALWAYS connected to the internet with a robust, fast cable connection. â€¢ I have no system-wide popup blockers, or malware utilities running. on Intel-based Macs running 10.5 or higher. Sooo...what installation or troubleshooting procedure am I missing here? If you have tried all available USB ports on your computer and have either no device recognition or poor audio quality (clicks-pops), you will want to consider purchasing a PCI USB 2.0 card to connect your Line 6 USB audio interface. Thanks in advance for pointing me toward any solutions...I champing at the bit to drive this thing around in Appleâ€™s Logic! Assuming you have the newest version of Monkey installed, run it to make sure the drivers and firmware are current. If you purchased this with extra model packs installed, flashing the xt may wipe them out if the seller did not "gift" them to you. (PODxt Live should come with FX-Junkie by default). Download and install Gearbox, this may be done with or without Monkey. Yes, I have the most current version of Monkey installed that will work on PPC Macs (as far as I know, anywayâ€¦info regarding PPC compatibility is missing in most of the descriptions of software on the D/L pages. Gotta D/L and try, in many cases, before I find out. 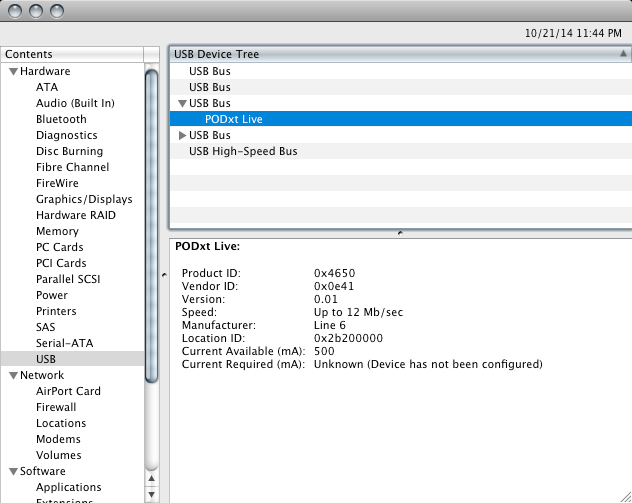 The attached screen capture image from "System Profiler" shows that my PodXT Live is, in fact, recognized as connected via USB. I'll go have a look for Gearbox...but something in my memory seems to remind me from looking before that there wasn't a version that worked with PPC architecture Macs [Â¿Â¿Â¿ shrug ???]. I dunno, I'll hit the Downloads section again. And yes, the guy I bought it from had extra model packs installed...He explained what they were, that he got them, and I can see them listed in the LCD display on the unit. If you are still in contact with the seller have him gift them to your account. If not you can give Line6 a call, maybe they will work something out on their end for you. No guarantees, but worth asking. Loading up Gearbox v 3.72 worked, and now recognizes my PodXT Live. Monkey, on the other hand, still fails to connect to anything online. Historically speaking, I've always been wary of auto-update anything. It's the first thing I disableâ€”if possibleâ€”on any new software I install. Currently digging through the Gearbox & Pod user manuals. Cool!! glad you have it sorted for now. Please, I'm with the exact same problem as Phos4D. I can neither connect my POD xtLive to gearbox (the PC don't recognize it) nor connect the internet to the LINE MONKEY.